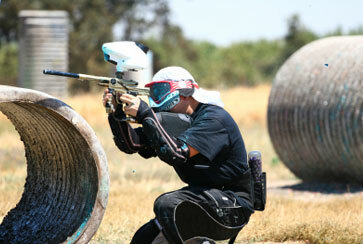 Paintball Guns (Paintball Markers) utilize CO2 (Carbon Dioxide) Gas. We carry Siphon Tanks and Cylinders used for Filling smaller CO2 Tanks and CO2 Cylinders. Customers can Buy or Rent CO2 Tanks and CO2 Cylinders specifically for Paintball to Refill their Paintball Guns. Broward Nelson provides Paintball enthusiasts with "One Stop Shopping" for their CO2 Tanks, CO2 Nozzles & CO2 Regulators. CO2 Gas Refills on Customer Owned Cylinders are available while you wait. Broward Nelson Sells and Leases a variety of CO2 Dispensing Equipment. Our service is second-to-none and our drivers are friendly and knowledgeable. Home Pickup and Delivery is available for a small charge additional charge. We believe in "ONE STOP SHOPPING" where one phone call will handle all your Paintball CO2 Dispensing needs! Call 800.262.8265 to schedule your delivery or for more information.